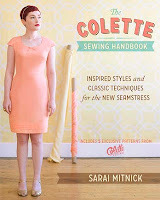 I ordered the Sew Colette book, since I really liked all the clothes and that I can make them and learn different techniques. 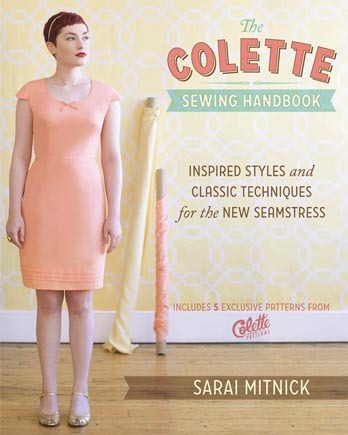 This seems like a perfect sewing book. My inspiration for buying the book came from the recent sew along. 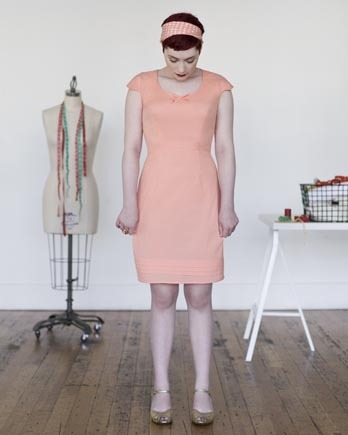 If you click the link, you can see lovely versions of the different garments in the book made by the participants of the sew along. I think the best thing about this book is that I like all the clothes and I will learn so much if I manage to sew all of them. The book is nicely organized, so that you first get the relevan theory and how-to instructions and then you have a project in which you can use and practice the introduced techniques. 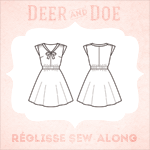 Since in sewing (and all other crafts as well) you only learn by doing, I think this is a great idea for a sewing book. 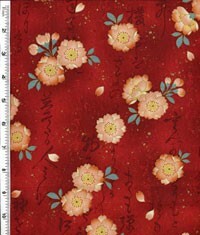 I have been buying fabric and I have fabric ready now for all of the 5 garments, or have ordered it anyway. 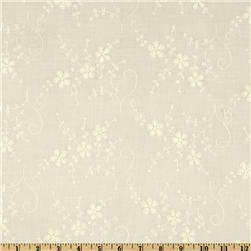 This is the first time I've ordered fabric online, so I hope they are what I think. Then again, I'm not that particular about the exact color, so as long as it looks good, it's enough. I also have the notions ready. I bought the lining fabrics from QuickFabrics.co.uk, and they had a great service: when you buy fabric, you can check a box and they will add a matching thread to your order. I think this is awesome and should be offered everywhere. And if you think you don't need it, you can just leave the box unchecked. The blue fabric is for Meringue, the pink for Pastille, and the green for Licorice. The two others have been ordered from the internet, but since I only did it yesterday, I don't have them yet. As I said, I'm a bit nervous what they are for real. I can't wait to get to sewing all these. I will start with the Meringue skirt tomorrow. I also bought some extra fabric from Eurokangas while I was wondering what to use for these garments. They have these boxes that have remnant pieces of the fabrics and you can buy them by the weight and they're priced like 25 €/kg. So these two fabrics I bought from that. Originally I thought I would use the orange see through for the Taffy Blouse, but since I found the embroidered one, I just couldn't not buy it. But maybe if it looks good, I'll make another one from this fabric. I originally thought the green one for Meringue, but it might be to thick for the scallops. 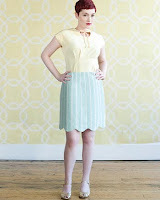 But I think I could make another version without the scalloped hem from this. Looking forward to sewing something from these as well!